Struggling universities should be allowed to close or be taken over by the private sector, says a think tank. 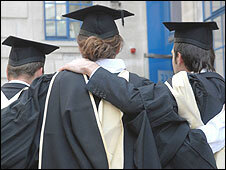 Universities receive £8bn in public money, but they face no threat of closure if they fail, says the report. Anna Fazackerley, head of education at the think tank, says the culture of saving universities means they are "unable to learn lessons from failure". The report, Sink or Swim? Facing up to failing universities, says that there has been a deeply-embedded assumption that universities will always be "shored up" regardless of their difficulties. "The idea of a university going to the wall is one that we have steadfastly ignored in Britain for many years," says the report. It argues that with such substantial public investment in higher education, there needs to be more public accountability from universities. The "no-fail culture" means that there is no real market in higher education, says the report. "An environment in which all vice-chancellors and governors know that if they get into trouble they will be bailed out can only encourage bad practice," the report concludes. And with the recession putting pressure on public and private funding, the think tank says that the prospect of a university having to close down is "a nettle that we must finally grasp". It highlights the financial dependency on the higher fees paid by overseas students of many institutions and the serious risks that could follow if there were any decline in numbers. It says there are universities in which income from overseas student fees now makes up the majority of student fee revenue. There are examples when universities get into financial problems, says the report, such as London Metropolitan University having to pay back more than £50m in funding. But the report also recognises the difficulties in considering closure. Apart from the threat to individual students and academic jobs, shutting a university would create political and economic difficulties. Outside London, universities have become major employers in their local area, and any closure threat will be a major issue for the local economy, says the report. The report also suggests that there are ambiguities in trying to balance the need to deliver value for money for taxpayers while protecting the self-regulating status of universities. Paul Marshall, executive director of the 1994 Group of research-intensive universities, says the role of the funding council as "market regulator" should not be "weakened or superseded". "It should be the role of the funding councils and government to set the framework in which competition takes place, but, beyond this, autonomous higher education institutions must have the freedom to find their own positions, and indeed succeed or fail, within this market place."